Earth at the time of the Permian-Triassic extinction, ~252 million years ago. Base map, and map below, are by Dr. Ron Blakey, ©Colorado Plateau Geosystems Inc. The Permian-Triassic mass extinction was the most severe biodiversity crisis in Earth’s history, with an estimated 90% of species disappearing. Occurring approximately 252 million years ago, it marks the boundary between the Paleozoic and Mesozoic eras¹. The Permian-Triassic is perhaps the clearest example in the fossil record of a “greenhouse” extinction, associated with the eruption of a massive volcanic province in Siberia and rapid warming of the planet’s surface, accompanied by sluggish ocean circulation, rising sea level, and anoxia in many marine environments². My work has focused on how these oceanographic changes affect the base of the marine food web: the inorganic nutrients and planktonic algae that ultimately support a complex fauna. The oceans of the Permian and Triassic were not a single environment, any more than the ocean is a single environment today; warm, clear waters supporting carbonate reefs coexisted with cool, productive upwelling zones. Shallow, sunlit epicontinental seas and permanently dark abyssal plains were both impacted by the extinction. The reorganization of ocean currents and chemistry across the Paleozoic-Mesozoic transition was spatially complex, and to fully understand it we need to take the approach of explorers, filling in the empty spaces on the map. I’ve focused mainly on the Panthalassic, a deep, open ocean basin that dwarfed even today’s Pacific. While it was the largest ocean on Earth at the time, Panthalassic sediments of Permian-Triassic age have only been preserved in a few places, with the Canadian Rockies and Mino-Tamba terrane of Japan containing some of the best exposures. More recently, I’ve had the chance to get involved in work on Penglaitan, a shallow-water section in southern China that may be our highest resolution surviving record of the latest Permian. Opal Creek: The Opal Creek section, in the Kananaskis Valley west of Calgary, is an important section for understanding the end-Permian on the northwestern margin of Pangaea. Deposited in an outer shelf or slope setting, Opal Creek seems to have been located in a cool, highly productive upwelling system that supported a reef-building siliceous sponge fauna until it was terminated by weakening circulation and increased sedimentation. Opal Creek has been the subject of comprehensive geochemical studies, providing some of the first field evidence for slowing ocean circulation at the Permian-Triassic boundary. Results from Opal Creek have been published in two papers, the first focusing on organic stable isotopes and biostratigraphy (PDF), the second focusing on trace element geochemistry (PDF). Work is ongoing, and results from the Opal Creek section continue to be published. Northeastern British Columbia: Two sections from the Williston Lake area in northeastern British Columbia, Peck Creek and Ursula Creek, provide a glimpse of the western Pangaean upwelling system at a higher latitude. These sections have a similar sequence of facies to Opal Creek, with a transition from biogenic cherts to organic rich siltstones and shales at the Permian-Triassic boundary and distinct pyritic horizons in the extinction interval. Having been deposited in deeper water than Opal Creek, they may be a more continuous record of the environmental change in the Late Permian preceding the extinction. Data from these sections is being prepared for publication, and supplemented with data from cores of the overlying Early Triassic. Penglaitan, Guangxi, China: The Penglaitan section, located on the Hongshui River outside of Laibin, is an unusual and fascinating record of the latest Permian. 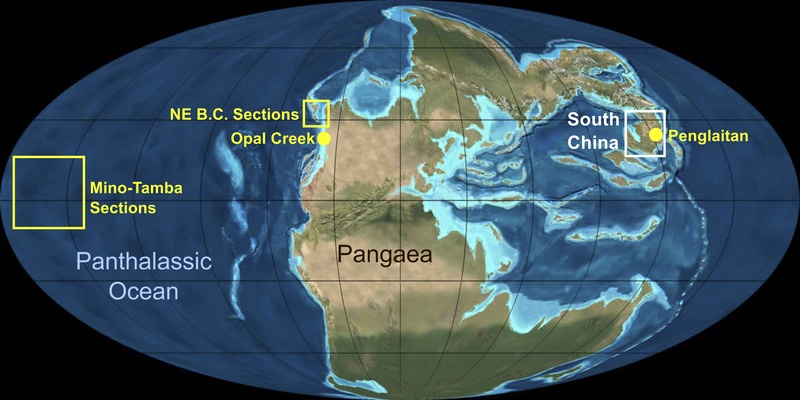 During the Late Permian, Penglaitan transitioned from a deep intracratonic basin environment to a submarine distributary fan, and experienced extremely rapid sedimentation in the final 200,000-300,000 years of the Changhsingian stage. The section contains over 600 meters of marine sediments in the late Changhsingian, as well as the final known terrestrial flora of the Paleozoic³. The high temporal resolution of these sediments will allow us to study the final millenia of the Permian in greater detail than is possible at any other known locality; working with colleagues in China, I’ve contributed to a study on the latest marine strata, which is currently being prepared for publication. Mino-Tamba terrane sections: The Mino-Tamba terrane is a succession of bedded radiolarian cherts deposited at equatorial latitudes in the abyssal Panthalassic ocean. Having been accreted to Japan, these sediments are a unique window into the Permian and Triassic ocean free from the influence of nearby continents or sediment sources. I have generated organic carbon and nitrogen isotope datasets for two of these sections, Ubara and Gujo Hachiman, that have been incorporated in studies of the greenhouse nitrogen cycle (LINK), and are being prepared for an independent publication. ¹ Erwin, D.H., Bowring, S.A., Jin, Y.G. (2002). End-Permian mass-extinctions: a review. In: Koeberl, C., MacLeod, K.G. (Eds. ), Catastrophic events and mass extinctions: impacts and beyond: Geological Society of America Special Paper, 356, pp. 353–383. ² Kidder, D. L., & Worsley, T. R. (2010). Phanerozoic large igneous provinces (LIPs), HEATT (haline euxinic acidic thermal transgression) episodes, and mass extinctions. Palaeogeography, Palaeoclimatology, Palaeoecology,295(1), 162-191. ³ Shen, S. Z., Wang, Y., Henderson, C. M., Cao, C. Q., & Wang, W. (2007). Biostratigraphy and lithofacies of the Permian System in the Laibin–Heshan area of Guangxi, South China. Palaeoworld, 16(1), 120-139.